Gutter Styles - A Visual Guide To Different Gutter StylesGutters & Guards, Inc. Although all of us here at Gutters and Guards, Inc. can spout off the names of different gutter and downspout styles on sight. we realize that this is an acquired knowledge. To help get you up to speed. we’ve compiled a few diagrams and examples that should make you a gutter identifying expert in no time. Seamless k-style gutters now account for over 80% of those installed today. The “k” in the name refers to the vague curve of the outer shape when viewed from the side. These types of ornate gutters are popular with modern homes because of the molding-like silhouette. Coming in all manner of colors and finishes, including galvanized steel and copper, these stylish systems easily blend into the architectural details of a home. Although generally harder to clean when not equipped with a guard, k-style gutters tend to withstand and hold more water and are stronger than other styles. Above is another example of this seamless gutter style. If you have to squint to distinguish between the oil rubbed bronze colored molding and gutter system, you’ll see just what we mean about it blending so easily into its surroundings. 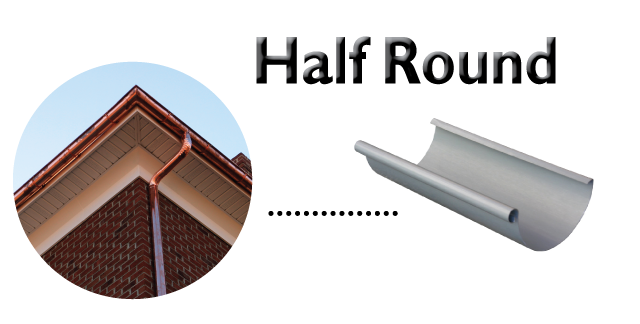 Another type of gutter system is a half round. The name for this gutter type isn’t hard to figure out, given the half rounded shape of the material itself. Half round gutters of today gained popularity in Europe as modern homes chose to adopt a period look similar to those used centuries ago. 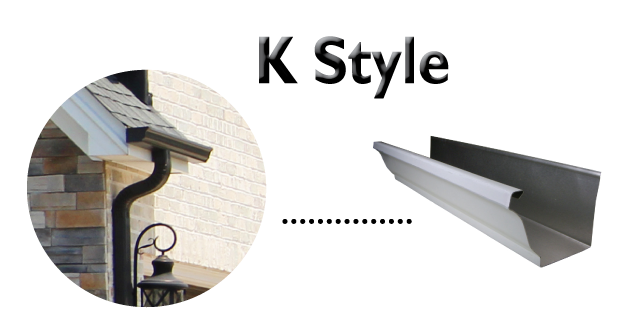 That said, k-style gutter systems remain the industry standard because of the elegant shape resembling interior crown molding. The main advantage to half round over k-style is the maneuverability of debris within the gutter itself. The curved and squared edges of k-style systems, although lovely can pose flow issues, while the symmetrically smooth interior of half round gutters are ideal for transporting runoff with ease. They are easier to clean and are less likely to corrode since water doesn’t have anywhere to collect. Half round gutter systems do tend to be more expensive though, and also hold less water than similarly sized k-style gutter systems, making them unappealing for homes in cities with heavy annual rainfall. There’s no denying the unique look and feel of half round gutters though, especially in the copper finish shown above. As you can see, the style works especially well with a home covered in cottage detailing, such as shake siding and shingles. Downspouts are another piece to the puzzle to consider, although a bit more straightforward than different gutter styles themselves. Round downspouts are again, exactly what you’d think – They resemble perfectly round pipes coming down from the gutter system hung at the height of a home’s trim. In basic terms, downspouts help to protect your home from water damage by directing run off away from the foundation of your home. Round downspouts are typically installed beneath half round gutter systems, as seen above. 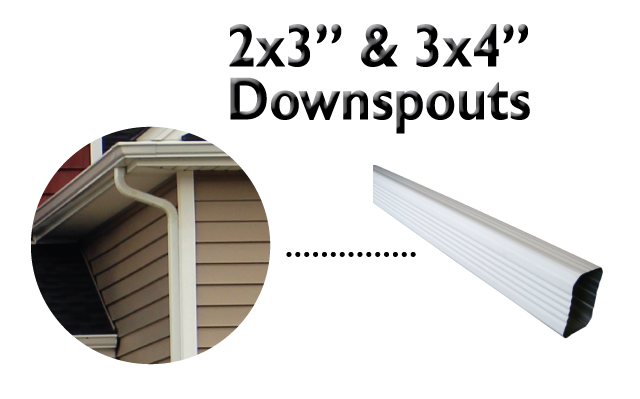 Round downspouts, like half round gutters, tend to be a bit more expensive than k-style gutters and their rectangular downspouts since more material is required during installation. That said, the elegantly round shape is often more appealing visually than rectangular. Moving onto those rectangular downspouts, these systems easily match the shape of the k-style gutters they tend to accompany. 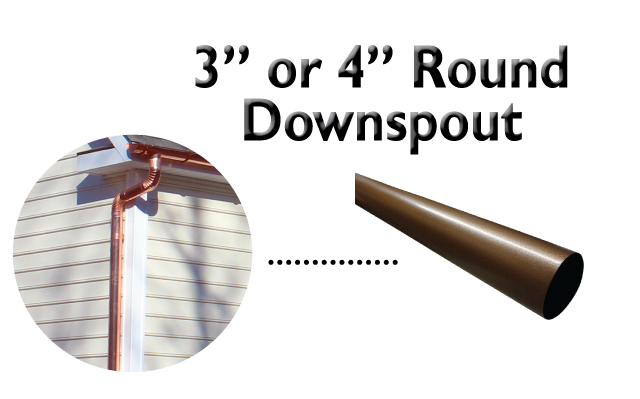 Also referred to as leaderpipe, downpipe, or drainspout, these types of downspouts work best for homes built in areas of heavy rainfall. And they too come in all sorts of color and finish options to match a home’s look. For a quick everyday guide to gutter systems and the different styles, click to and bookmark our gutter illustrations page here. And if you ever want to upgrade or repair your existing gutters, feel free to call us today to set up a free estimate.